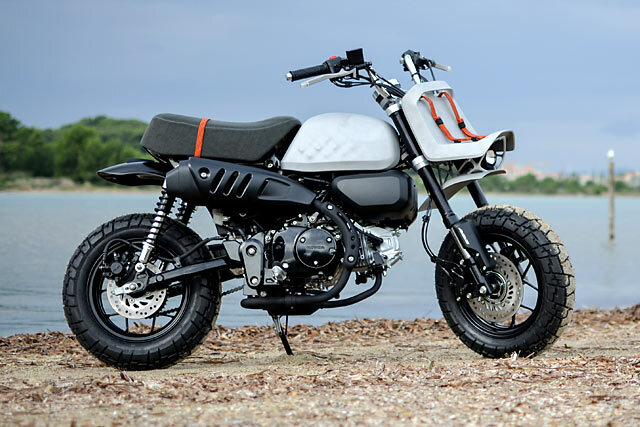 The all new Honda Monkey was always going to be a sales success; packed full of nostalgia in an era of retro remakes, cheap to buy and easy to ride. Based around the framework of the Grom, the decision to make the Monkey must have been one of the easiest ever made at Honda headquarters. But little could they imagine that their entry-level commuter machine would so quickly be used as the basis for one of the most technologically advanced bikes we’ve ever featured on Pipeburn. French design house VIBA is back, with a sweet little lady they call ?Jane? and she’s taking 3D printing to the next level. Designer Yann Bakonyi has never been a man to be confined by convention, always using the latest technologies from design to manufacture to produce an end product truly like no other. He’s already completed two limited production run motorcycles, with a mental MV Agusta and a Triumph Bobber tailored to the rich and famous. The success of both spurred him on to find an even greater challenge and a way to emulate his remarkable computer rendered designs in equally advanced physical form. So the French company reached across the border to Germany to partner with two companies who are leading the way in 3D printing. The first is SLM Solutions who has built such a reputation that Audi used their skills and machines in developing parts for their aerospace adventures. And Rolf Lenk who were the first company in Northern Germany to 3D print metal parts and form the third arm of this formidable team. So why in such an endeavour use a commuter bike like the Monkey, Yann explains. ?Jane is playful, could not take herself too seriously, as John Lennon or the Jackson Five, driving feverishly like the iconic version from the 70?s. But melancholy isn?t VIBA?s business, and because it seems ridiculous to associate mobility and austerity, Jane is transcending several concepts to unite them: elegance, innovation, design and accuracy, which are essentials to any objects of style. VIBA is highlighting the craftsmanship from the 21st century, through the smart use of 3D printing, to find a clean design and simple values, aiming simple mobility, with style and smile.? The most significant piece of the collaboration is also a world first, it may look like a standard Monkey fuel tank in a metal finish; it’s anything but. From Yann’s brilliant design to SLM Solutions big dollar machines, the item is entirely 3D printed aluminium. The single piece not only provides added strength but also a significant weight saving over the factory item. But it’s inside where the real magic happens, honeycomb like structures fill the tank to prevent sloshing of fuel and ensure perfect pick-up. You can hear the race teams calling already, no more blocks of foam! ?It may look like a standard Monkey fuel tank in a metal finish; it’s anything but. The item is entirely 3D printed aluminium. ?